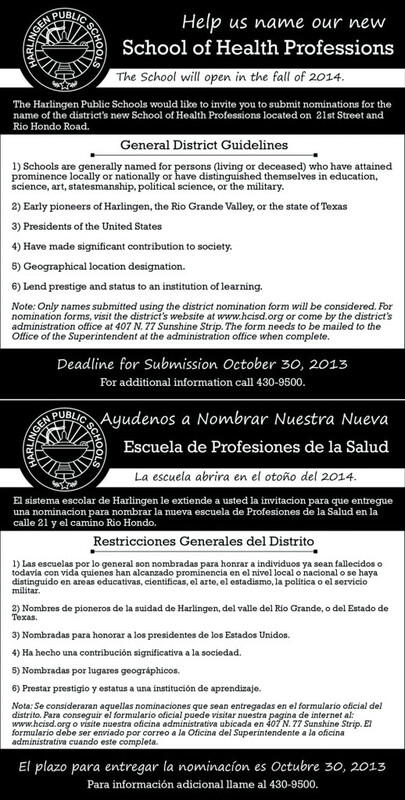 The Harlingen Consolidated Independent School District invites the community to submit nominations for the name of the district’s new School of Health Professions opening Fall 2014. The campus is located on 21st street and Rio Hondo Rd. For HCISD’s general naming guidelines and nomination forms, visit the district’s website at www.hcisd.org/healthschool or come by the district’s administration office at 407 N. 77 Sunshine Strip. When completed, the form needs to be mailed to the Office of the Superintendent at the administration office. Only names submitted by using the district nomination form will be considered. The deadline for submission is Oct. 30. For the nomination forms click on the photo above or click here. For additional information please contact (956) 430 – 9500. George W. (Dubya) Bush School of Health.